I don’t much like taking photographs inside buildings. So often the light is poor or difficult to work with, and spotlights and windows both tend to mess up autoexposure, even with matrix metering which is supposed to cope with such things. It’s all fine when you have plenty of time to make readings and set settings, but can be tricky when you are working under pressure. 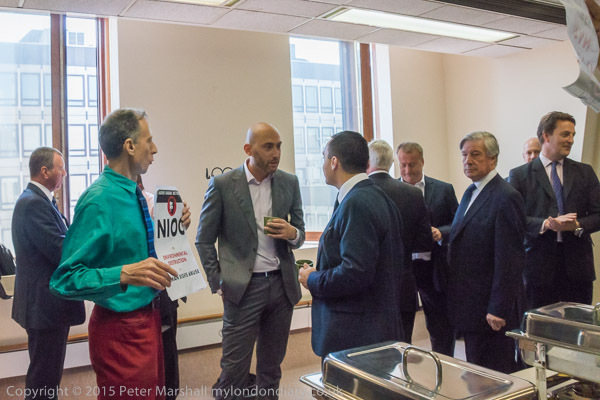 And in NIOC House I was certainly working under some pressure. 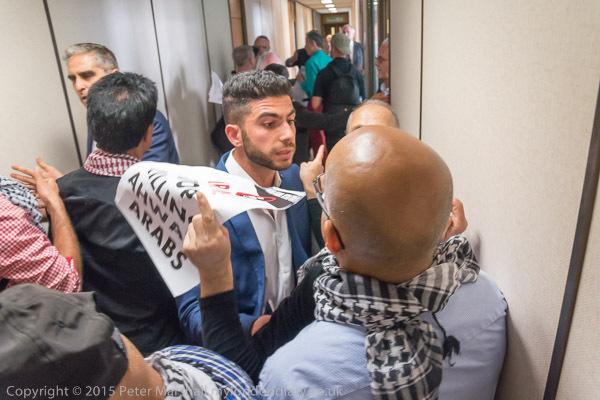 I wasn’t there by invitation, but had rushed in following some Ahwazi Arab protesters. I’ve mentioned them before, but for anyone who isn’t sure, you’ve probably read about the Ahwazi homeland even if you’ve never heard of it, as it is supposedly the inspiration for Genesis’s garden. The death-knell for the Ahwazi Eden came with the discovery of oil there by the Anglo-Persian oil company in 1908, since when Iran, aided in the years before the Iranian revolution by the UK, has been trying hard to eliminate the Ahwazi people and culture. Even before the recent moves to lift sanctions there have been continued links between the UK and Iran, with NIOC house, less than 5 minutes walk from Parliament, at the centre. Few people walking past would know what goes on in there, or indeed that the initials stand for National Iranian Oil Company. It’s surely significant that although its address is always given as Victoria St, the only entrance normally in use is tucked away at the back on Tothill St.
Back in April I went into the foyer with a small group of Ahwazi protesters (see Ten Days of Rage for Ahwazi Intifada) and at the end of June received an invitation from the Hashem Shabani Action Group to join with them and the Peter Tatchell Foundation in an attempt to gate-crash secret UK-Iran business talks taking place in the offices of the British Iranian Chambers of Commerce (BICC) inside NIOC House. 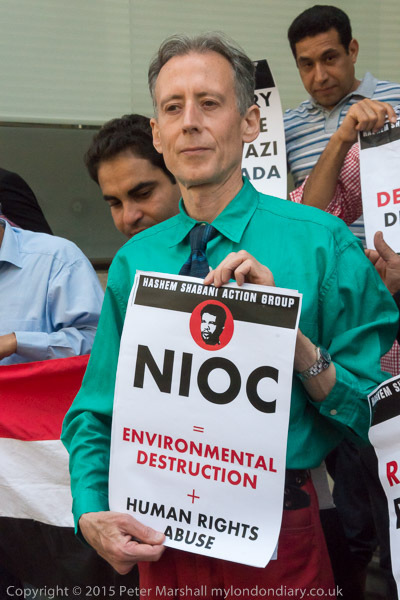 I met with the group outside Westminster Abbey, were Peter Tatchell gave a short briefing on what they were proposing to do, and in particular on the non-violent nature of the protest. Also present were two other photographers I knew, along with two videographers and an intern. Security fail to stop an Ahwazi protester who runs past them. 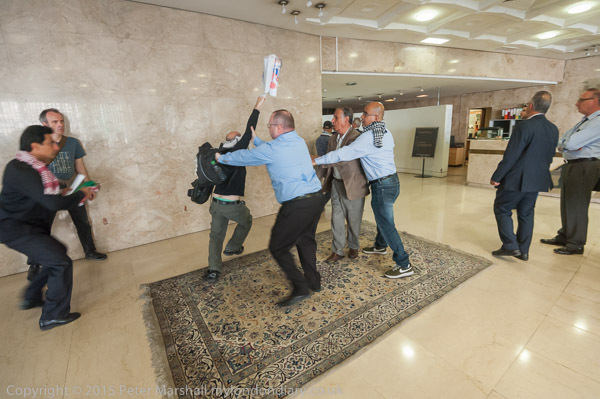 I was more surprised not to be stopped by the building security as I followed the protesters who pushed past them and rushed to the stairs, along with the other two photographers; the videographers were a little slower and were apparently stopped in the foyer. Had I known in advance that the meeting was on the sixth floor I might have declined the offer to attend the protest, and rushing up the stairs I was rather worried that I might not make it without collapsing, though I actually caught up with some of the protesters who were half my age. 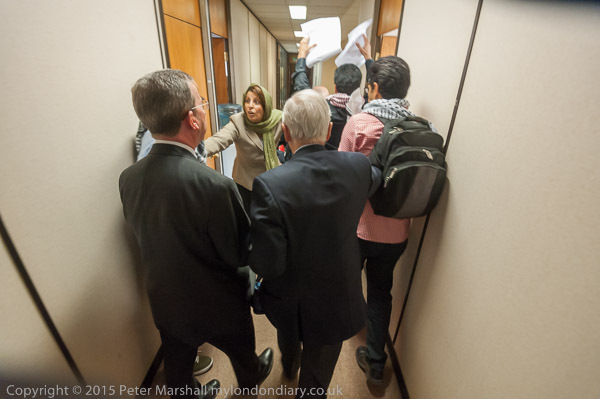 Despite being pretty totally knackered, put of breath and with a heart thumping at an unhealthy rate I was still able to follow the group as they ran along the corridor to the rooms where the meeting was being held. There was a certain amount of pushing and shoving in the corridor, and there were people telling me I couldn’t take photographs, but as none of them told me who they were and what authority they had to stop me I proved remarkably deaf. Everyone was a bit confused, but eventually we went into the room where those at the meeting were about to enjoy what looked like a very decent buffet lunch. Things inside the room were a little more civilised, with many seeming to totally ignore the protest and continue with their conversations, but when we got back into the corridor and were on our way out things became more hectic. Coming out of the meeting room I took the wrong door and turned left towards the stairs rather than to the right and missed the opportunity to photograph the best known politician attending the event, Lord Lamont. 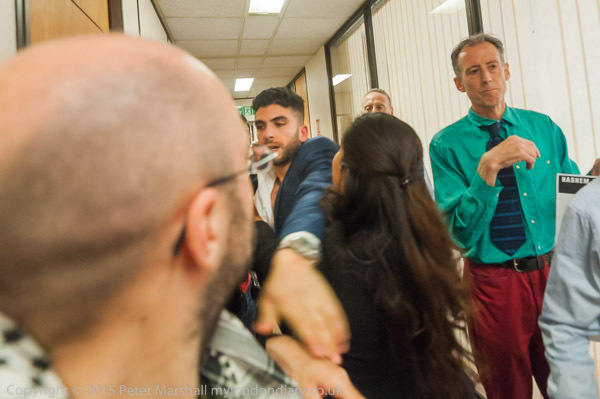 I was at the wrong end of the corridor with people blocking my way when he was confronted by protesters, though both the other photographers were close to him and were able to get pictures. A few of the people who were trying to stop the protest did get rather physical, and one young Iranian, thought by the protesters to be an agent, obviously completely lost his temper, and had to be pulled off by some of the other staff after he assaulted one of the other photographers, knocking him to the ground and causing minor injuries. At least I didn’t get more than a little shoving around, but photographically I was having problems with the D700 which had started to fail to focus and also over-exposing, both extremely annoying. It wasn’t really possible to try another lens on the camera as there was quite a lot of people milling around and I was getting pushed around as I was taking pictures. The light in the corridor was giving me exposures around 1/30 f4 (wide open on the 16-35mm) and with overexposure giving me even slower speeds and considerable subject and camera movement quite a few exposures were unusable. I would have been better to have used the fixed 20mm f2.8, but I hadn’t thought to put that in my bag. The 16-35mm f4 isn’t really a lens for low-light action, and is also big and heavy, and my lens is beginning to show its age. A year or so ago it needed a very expensive service, almost to the point it wasn’t viable. Now it does seem to be getting a little temperamental, and though it was working properly when I took a few pictures of the group outside NIOC after the event, occasionally since then I’ve had to switch to manual focus. At fairly close range even at 16mm there isn’t a great deal of depth of field at f4, and manual focus in poor light isn’t too easy with modern cameras and lenses designed for autofocus. Back in the days of film with cameras like the Olympus OM4 and a suitable choice of focussing screen manual focus was much more viable. And with cameras like the Fuji X-T1 that use an EVF, manual focus is again easy, though too slow for rapid moving events like this. Eventually we left, walking down those six flights of stairs again (I don’t know why they didn’t take the lift down, but I had to stay with them in case anything happened.) In the ground floor lobby we were stopped by police, and told that we were not under arrest but could not leave, even though we photographers showed our press cards. 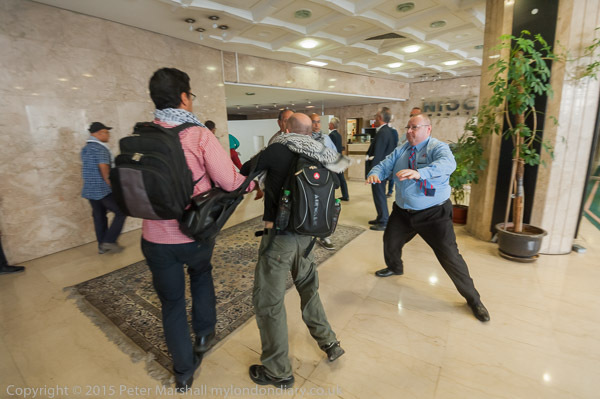 We sat around in the lobby for three quarters of an hour while the police decided what to do, complicated slightly by the complaint of assault against the young Iranian. Police advised the photographer that his assailant – who they went and found and questioned briefly – probably was protected by diplomatic immunity and he decided not to press charges. The police came round and asked everyone for names and addresses which we gave and then we were allowed to leave. It was good to get outside. Although I don’t think any of the protesters (or photographers) was later arrested, certainly some of the non-violent Hashem Shabani Action Group, named after Arab-Iranian poet and human rights activists Hashem Shabani, executed for peaceful opposition to the Iranian regime in January 2014, have been harassed by police. 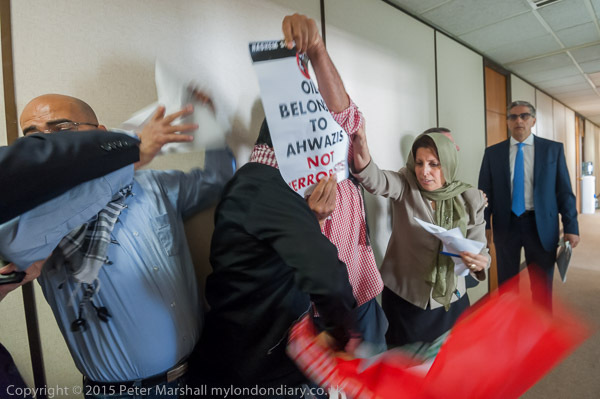 Some influential UK politicians with busiiness interests in Iran, including some of those at this meeting we visited, have called for the organisation – which says “Our weapons are pens. Our bullets are words” to be banned as a terrorist organisation. Iran says that Shabani confessed to being a member of the terrorist group “Al-Moqawama al-Shaabiya Al-Tahrir al-Ahwaz” which appears to be a figment of Iranian state imagination. The confessions made by Shabani and others came after extensive torture. Press TV reported the confessions and sentence claiming that the Al-Moqawama al-Shaabiya (People’s Movement) is backed by the US and UK, but there appear to be no reports of the organisation nor its supposed activities except from these Iranian government sources. Unfortunately the UK seem more interested in backing Iranian interests and ignoring human rights issues in Iran in general and in particular the persecution of the Ahwazi people. This entry was posted on Tuesday, October 20th, 2015 at 09:50 am and is filed under My Own Work, Photo Issues, Political Issues. You can follow any responses to this entry through the RSS 2.0 feed. You can leave a response, or trackback from your own site.